Alleluia Panis, the Artistic & Creative Director of Kularts, and Irene Faye Duller, a Filipina artist, record a StoryCorps session in San Francisco. SoMa Pilipinas Filipino Cultural Heritage District, concentrated in the South of Market neighborhood of San Francisco, is home to performance spaces that document and nurture the growth of Filipino arts and artists. Three of the eight Creative Work Fund Visual Arts Grants this year were awarded to arts organizations in based SoMa Pilipinas: Kularts, South of Market Community Action (SOMCAN), and Kearny Street Workshop (KSW). 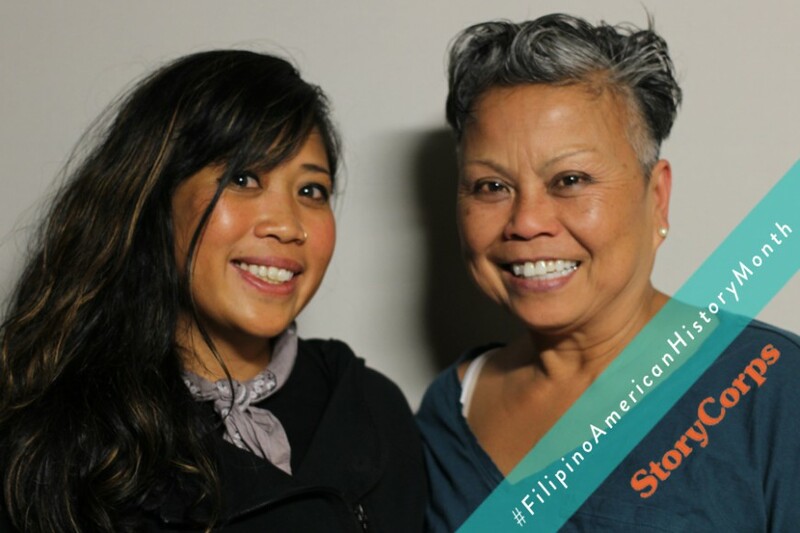 In celebration of Filipino American History Month, CAAM and StoryCorps SF collaborated to capture some oral histories from Filipino Americans in SoMa. 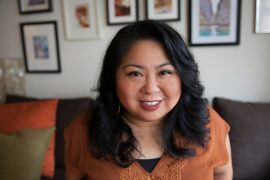 In the StoryCorps recording between Alleluia Panis, the Artistic & Creative Director of Kularts, and Irene Faye Duller, a Filipina artist, it is evident that Kularts fosters a space where Filipino American artists can explore the multiple narratives surrounding their intersectional identities. “Let’s just do it,” Alleluia says of the attitudes of the artists when it comes to performing for the community. The artists have always been deeply rooted in the community and find art as a space for Filipino self-empowerment. KulArts is a performance group of contemporary and tribal Filipino arts. As one of the three SoMa projects that are 2016 CWF grant recipients, Kularts has a strong connection to the Filipino community. Founded in 1985 as Kulitang Arts, it is the premier presenter of contemporary and tribal Filipino Arts. The nonprofit arts organization aims to explore American Filipino culture while preserving the spirit of ancient Filipino art forms. The Philippines has had a long and complicated relationship with the United States. Within the United States, many Filipinos had faced discrimination. Art being a place for self-empowerment means it also becomes a place for decolonizing. Founded on the basis of Filipino self-empowerment and self-determination, Kularts not only produces art performances but they also host educational art programs for fellow artists and a Philippine Tribal Tour. Kularts is a source of Filipino empowerment through the arts. They both provide spaces for Pilipino and Filipino American stories to be shown by Pilipino and Filipino Americans. SoMa Pilipinas helps facilitate a space for this collaboration of Filipino arts, culture, and traditions. The visibility of the Filipino community in SoMa is important and urgent. Kularts plays a key roles in shaping Filipino cultural identity through the arts with nuanced and layered storytelling. For more information about KulArts, visit their website. Upcoming events include a celebration of the life of Danongan Kalanduyan on November 5 and 6. Alleluia Panis: In the 70s, as a young dancer, I was invited by some Filipino dancers to come join them in the Filipino Organizing Committee, we were called the Artists Committee. In the dance thing, I was probably the one that had recently immigrated, meaning the last 7 years. The rest were second, third generation Filipino Americans. Irene Faye Duller: It was like art in the margins. AP: Yeah, the conversations, I sort of like, what is this? That in itself, kind of like, ok, I’m cool with trying to figuring out what is this Filipino Organizing Committee or this Artists Committee and what are they trying to do. So that’s how I got involved with the SoMa, is through the dance. We were right on 8th and Natoma. AP: I knew some friends who lived in the SoMa. they lived in those alleys in Natoma and Russ in the victorian homes there. They were basically normal immigrant kids. They were my connection to the Philippines. A lot of them were newly arrived. I mean, I was newly arrived too. My father’s opinion of the SoMa was not very good. It was already as urban as it is now. Families, that’s the only place they could afford, mostly allowed [bc of affordability], was in the South of Market. There was also this very interesting thing about being kind of their own island within their homes. IFD: Was it like a barangay still, like a barangay mentality? AP: Yes, it was, because a lot of people were related in some way, shape or form. So they created their own barangay themselves. I also had friends living in the alleys, Doray, those little alleys. They would have their studio apartment in some old Victorian flat. So there are other folks that are not necessarily immigrants, but are Filipino Americans, maybe 2nd or 3rd generation, that were living in that area. AP: And artists. There were artists. IFD: They always say people who will inhabit inhabitable spaces will be the immigrants and the artists. 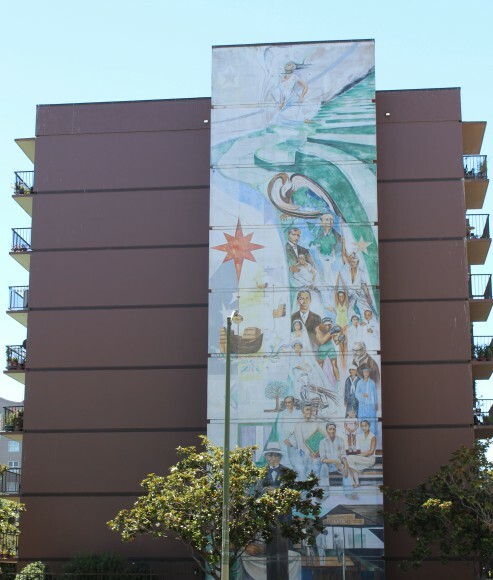 I want to get to this place in SoMa where you are painted on a mural. These are streets that are hard to get to, because they’re not really highly trafficked streets. And it’s Mabini Bonifacio, Lapu Lapu street, which are all Filipino heroes. The Filipino Senior Center is there. And there is this beautiful community garden, and there’s this beautiful mural that’s like 3-4 stories tall. AP: I think it’s more like 5. IFD: And the artist, her vision for this mural was to tell this rich visual history of the heroes of Philippine history. AP: It’s called Lipi ni Lapu Lapu, which means clan of Lapu lapu. All the heroes you can think of, Bonifacio, Tandang Sora is there. IFD: Pancho Villa the boxer, that’s some Filipino American history right there. But what’s amazing is that i’m talking to someone right now who is on that mural. And you were a 20-something year old Alleluia. And you’re alongside all those greats. This is amazing to me who is studying and teaching history of the Filipino people because what you’ll find most accessible is a sad story, it’s a story of conquest, it’s a story of colonization and Filipinos even being second citizens in their own land, and then coming here, and we’re living in low income projects, pretty much. But this is uplifting imagery because it’s telling all the stories of the victors. and I’m so proud to say that my godmother is on that as a 29 or 28 year old dancer. You didn’t know that 10 years after that you would find the Kulintang Arts Ensemble, and then becoming Kularts, and then now for how long has it been? AP: Well, Kularts is now, what, 31 years old. That wall has been dilapidated for decades. MC and I had been talking about, let’s paint something on that. I really wanted to bring the indigenous and the contemporary in it because the students are going to be facing this mural on a daly basis,will be able to recognize themselves and their relatives when they see the mural. You have done that as a orchestrator of putting art on the street of SoMa in that moment and I feel like that’s a banner that you’re holding up through your work with Kularts in the SoMa today. AP: Those ideas ideas actually came out of people are living in their homes, let’s get them out, let’s use our culture to vibrate, but not just any old song, but something that will resonate further. IFD: In a way, it’s like, you can’t displace us. We’re here. If we fast forward to the present, SoMa Pilipinas is now officially a heritage district, and artists are at the forefront of that as well. What I know is that we want a Filipino performing arts center. We’ve created without land and without space here and in the Philippines, so how much greater will be produce if we have that space? AP: I think so. I think the visibility of Filipio Americans is now coming to the forefront because we’re finally realizing, we have really arrived. We’ve been arriving since the early part of the last century and time to take space, time to accept it. Patricia Cruz is a Memories to Light Intern at CAAM and is a student at UC Berkeley. She is interested in Asian American and Asian Diaspora Studies and also makes short films in her spare time. Her work has been selected in student film festivals and she hopes to show Asian American narratives in her films. Recorded by StoryCorps, and edited by Rachel Bain. Rachel Bain is an audio engineer and web developer in the Bay Area.